Get The Smile You Have Dreamed of at Mark Weitzman D.D.S. If you are looking for a quality family or cosmetic dentistry services, you have come to the right place. Our center is dedicated and passionate about providing superior results in the dental industry. 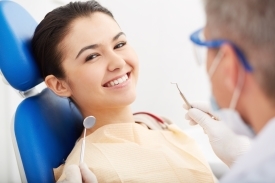 We are a recognized dental office committed to patient satisfaction. We have a reputation of excellence and are known for providing an environment that makes patients look forward to their visits. Our staff wants to make you and your family feel comfortable and welcomed in our office. Get your free consultation now by calling (805) 295-8896. 5 Reasons You Should Come to Mark Weitzman D.D.S. We have a professionalism and dedication to quality that has led to several recognitions in our industry. You want experience and passion when it comes to your dental services. Dr. Weitzman is a Top Rated Dentist and rated the Best of Ventura County. We offer free consultations for your dental needs. Dr. Weitzman is an experienced master ceramist. Our patients and their satisfaction are our top priority. When it comes to cosmetic dentistry, you need someone with knowledge and experience. We have that as well as only the highest-quality products to give you the results that you want. We are a full-service dental office equipped to fulfill the needs of your whole family. Come to us for your children's cleanings, any root canals, crowns, veneers or dental implants and we can ensure you will get the results you are looking for. Your initial consultation with us is free, give us a call today at (805) 295-8896 to get started. Serving patients in Los Angeles, Ojai, Beverly Hills, Thousand Oaks, Oxnard and all of Ventura County.